Go to SellingRestaurants and select the link "Sign NDA" and you'll get to visit this store. Look for listing 5253. Here is one of the nicest built out delis in all of San Diego. It’s so nice that calling it a deli is very much an understatement. Seller built this restaurant out from the ground up and it is both beautiful and functional for nearly any menu concept you could imagine or want to operate. Restaurant has an open kitchen style ideal for a Sushi or noodle shop, Pizza or Italian, or even a Sports bar, with minimal change your concept would fit right in. Restaurant has a premium corner location on in a huge apartment complex with potential customers literally living above and all around you. These are just your residential neighbors looking for meals and a place to hang out. 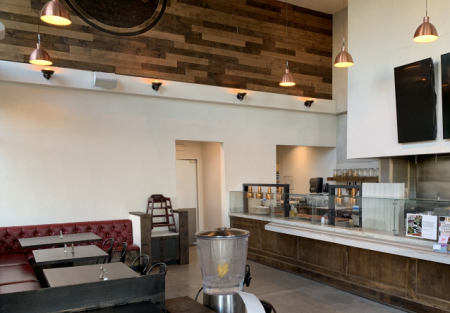 Restaurant is centrally located on a super busy street in the commercial and business district hub of the 805/163 and 15 freeways in Kearny Mesa. The new Kaiser Hospital campus, San Diego county offices, San Diego police traffic division department and Rady’s children’s hospital are all nearby. Seller had the money but not the restaurant experience needed to bring this place to its full potential. They have a beer and wine license and 12 taps to handle a sports bar type variety of IPA’s, Micro brews. The full kitchen has all new equipment under a seventeen-foot hood system.The Ansul system and grease trap are all in and brand new as well. The walk-in cooler is here too, all design and details were professionally handled by restaurant contractors during the build out of the restaurant and it shows. Jump right to the front of the line and save huge money in doing it. No planning, permitting and construction to deal with, it’s ready now. The restaurant is 1540 square feet and rent is currently being abated to $2575 per month all in! There is a very nice fully gated outside patio with nice views of the surrounding area. Landlord has reduced the rent from the terms included in the existing lease. Lease term expires Jan 2026 with two five-year options available. Hours of operation are 8am- 2:30pm daily and gross sales for 2018 were $283,477. Come by today to see if this is the place you have been waiting on.